Axial Seamount is the most advanced underwater volcanic observatory in the worlds oceans. This site is the most magmatically robust volcano on the Juan de Fuca Ridge, having erupted in 1998, April 2011, and again in April 2015. It hosts numerous active hydrothermal fields (e.g. ASHES and the International District) and abundant sites of diffuse flow. A diverse array of geophysical, chemical, and biological sensors, as well as an HD camera and digital still camera, provide real-time information on linkages between seismic events and fluid flow. 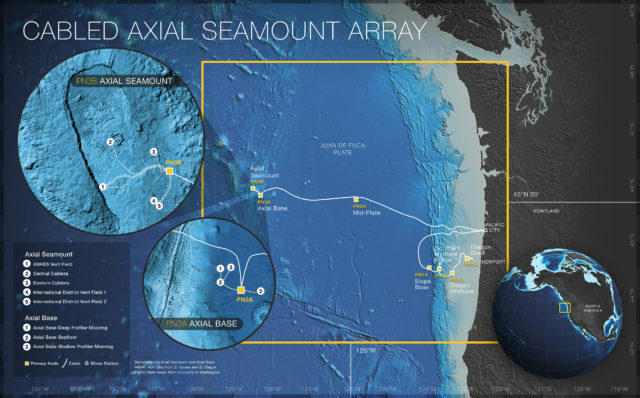 Nearby, at the base of the Axial Seamount is a cabled mooring site, Axial Base. 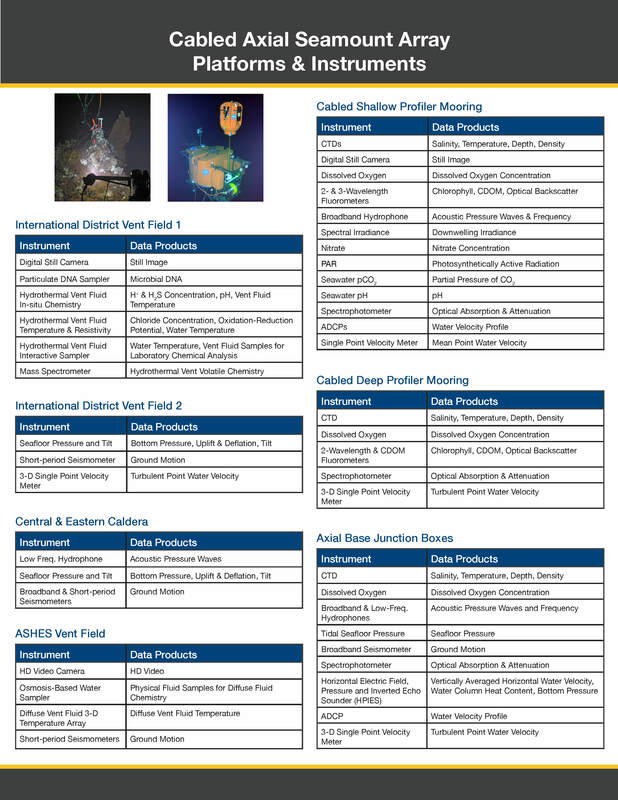 The water column sensors are deployed on 1) moorings with instrumented wire-following profilers, and 2) two-legged moorings that provide 3 kW power and 1 GB communication to instrumented platforms at 200m depth, and instrumented winched profilers. These provide key insights into a region that is strongly forced by air-sea interaction, shelf-slope interactions with the deep sea, and coupled atmospheric/oceanic phenomena acting to produce variations in North Pacific circulation over gyre scales. On the seafloor next to these moorings are complementary sensors that enable interdisciplinary observations of water-column processes. 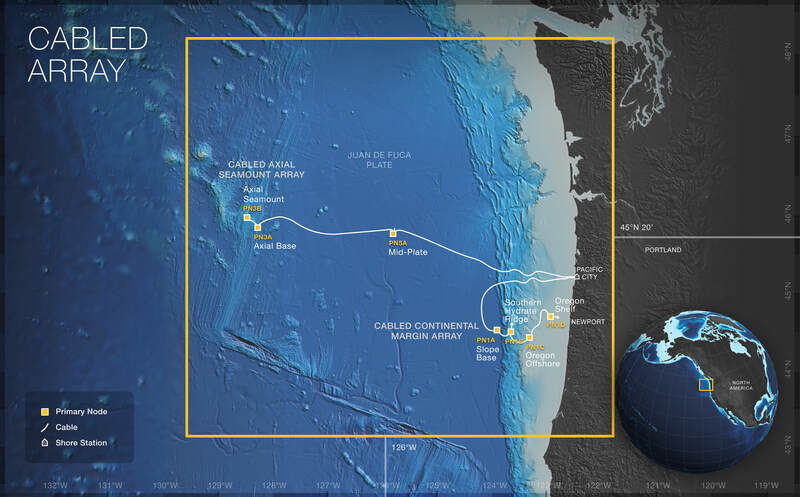 As the first U.S. ocean observatory to span a tectonic plate, the OOI Cabled Array provides a constant stream of near-real time data from the seafloor and through the water column across the Juan de Fuca plate. The Cabled Array provides unprecedented power (10 kV, 8 kW) and bandwidth (10 GbE), and two-way communication to scientific sensor arrays on the seafloor and throughout the water column. 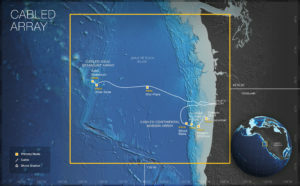 A shore station in Pacific City, Oregon includes two cable landings serving key sites on the Cabled Array: 1) Slope Base, Southern Hydrate Ridge, and the Endurance Array Oregon Line; and 2) Axial Seamount, and Axial Base. The ~900 km of modified telecommunications cable (installed in 2012) provides high power and bandwidth to seven Primary Nodes: PN1A (Slope Base), PN1B (Southern Hydrate Ridge), PN3A (Axial Base), PN3B (Axial Summit), PN5A (Mid-Plate), PN1C (Oregon Offshore), and PN1D (Oregon Shelf). 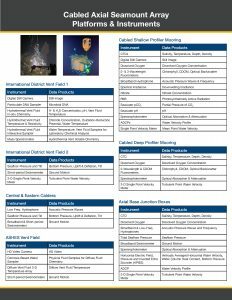 For more information, check out the Cabled Array related news stories. This array includes following research sites and platforms.